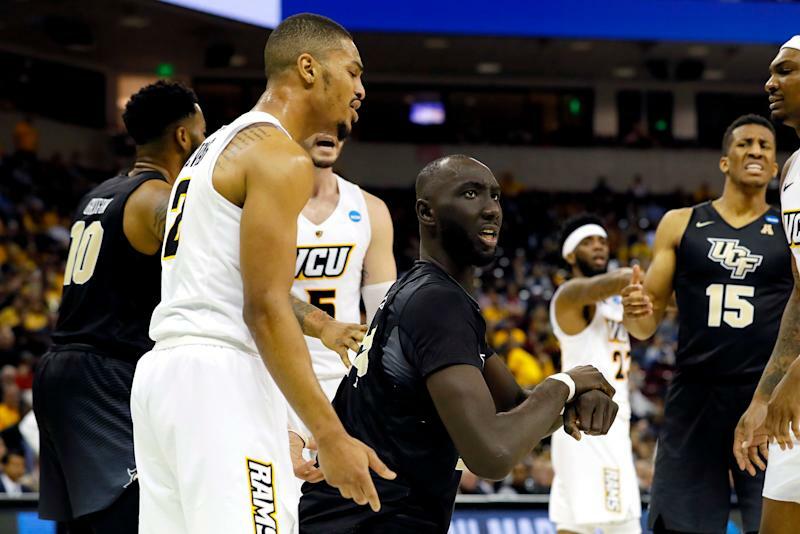 As easily the NCAA tournament’s tallest player at 7-foot-6, Tacko Fall might be the only player in basketball that can go viral from his knees. During a seemingly innocuous break in the action during UCF’s first-round game against VCU on Friday, Fall found himself standing up on his knees. Next to him was VCU guard Marcus Evans, who is 6-foot-2. Incredibly, Fall — who, again, was on his knees — looked as tall as Evans. In a postseason full of Tacko Fall fun facts, the UCF center being taller than actual, full-sized Division-I basketball player from his knees would top them all. However, the heights in that image might not be entirely what they appear. Is Tacko Fall really that tall from his knees? Of course, there could be some forced perspective going on in that visual. Evans is very clearly leaning toward the camera, while Fall seems a little more upright. That could easily cause a few inches to be warped. To do some quick math, Fall is 90 inches tall standing, while Evans is 74 inches himself, making Evans 80 percent of Fall’s height. Odds are that more than 20 percent of Fall’s height comes from his knees down — this study found the average proportion to be 30.5 percent — so Fall’s height in the picture above is probably benefiting from some tricks of the camera. There is also this photo from Getty Images, which appears to show a similar moment with Fall kneeling next to Evans. Clearly, Evans appears taller. Even if the kneeling picture is an optical illusion, there is no denying that Fall is monstrously, hilariously enormous. CBS’ Tracy Wolfson, who is 5-foot-2 served as evidence of that on Thursday. Fall continued to show that all game, not just from his knees, as he looked like a man among fourth-graders against VCU. Fall finished with 13 points on 6-of-9 shooting with 18 rebounds, more than the rest of the UCF starters combined, and five blocks, more than every other player in the game combined. Next up for UCF will be No. 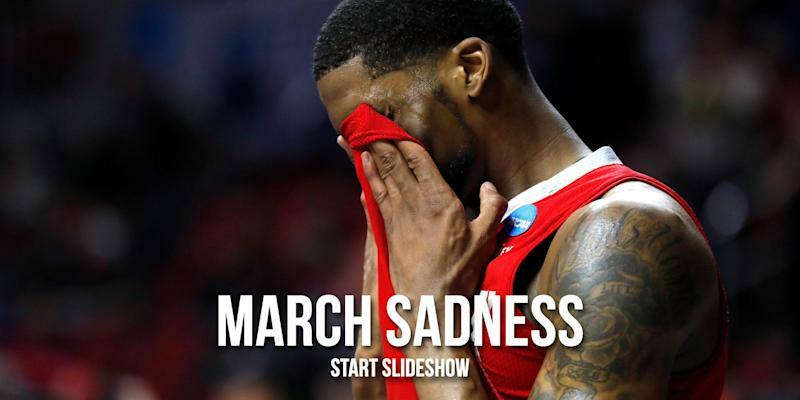 1 overall seed Duke in the second round, where Fall will face off against Zion Williamson and R.J. Barrett in what should make for must-see television.